”Linse” Radio-controlled boat – FOP Shvachko V. V.
During World War II, German Navy (Kriegsmarine) used the Linse radio-controlled boats. This boat was designed for diversion operations to undermine the enemy ships. 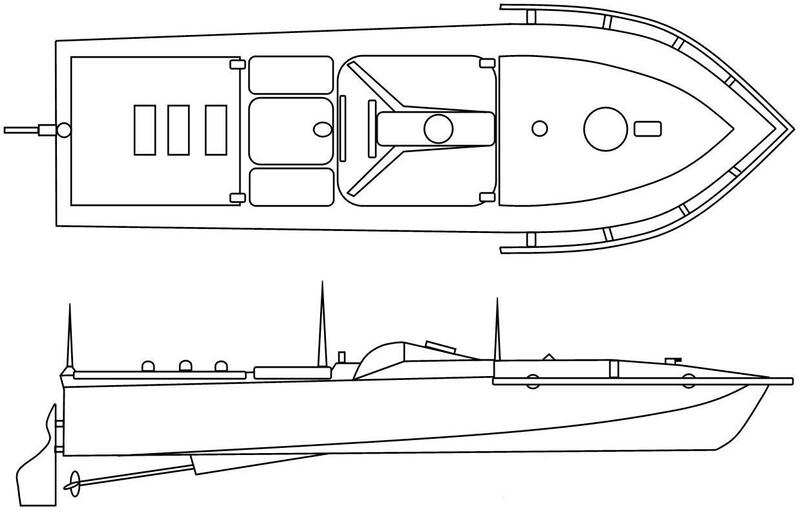 Linse had a length of 5.75 m, width – 1.75 m, crew – 1 person, the engine power of 70 kW, 1 propeller. The boat was capable of traveling at distance of 100 nautical miles (185.2 km) with the cruising speed of 15 knots (27.78 km/h). Two smoke bombs and/or a machine gun or grenade launcher (Panzerfäuste) for a close combat can be on board. Combat operations were performed, as a rule, by group which consisted of three boats: one boat of control (remote guidance) and two boats to undermine the target directly. The boat for explosion was brought to the target at a distance of up to 300 meters and, then, the driver left it (later the boat of control picked up this driver). Next, the boat of control guided remotely the boat for explosion to the target. The metal frame, fixed in the fore body of boat, activated the main explosive charge (from 300 to 480 kg of explosive, it was placed in the stern of boat) at the impact with the target’s hull. The explosion was carried out with a delay of about 3 to 7 seconds in a submerged position under the bottom of the attacked ship. In October 1944, 385 Linse boats were produced. By the end of the war there were plans to increase this number up to 1201 units. 1. Sprengboot Linse. – Mode of access: http://de.wikipedia.org/wiki/Sprengboot_Linse. 2. Datei:Sprengboot Linse.jpg. – Mode of access: http://de.wikipedia.org/w/index.php?title=Datei:Sprengboot_Linse.jpg&filetimestamp=20110111071106. 3. Einsätze deutscher Kleinkampfmittel zur See. – Mode of access: http://de.wikipedia.org/wiki/Eins%C3%A4tze_deutscher_Kleinkampfmittel_zur_See. 4. Sprengboot. – Mode of access: http://de.wikipedia.org/wiki/Sprengboot. 5. Tyske sprengbåter og enmannstorpedoer. – Mode of access: http://www.youtube.com/watch?v=c_P01Y-o3AA. 6. filmarchives online — filmarchives online // Die Deutsche Wochenschau (733 / 40 / 1944). – Mode of access: http://www.filmarchives-online.eu/viewDetailForm?FilmworkID=8db1b154187506c30aa8060613c685a1&content_tab=deu&set_language=en. 7. Deutsches Bundesarchiv (German Federal Archive) // Picture database. – Mode of access: http://www.bild.bundesarchiv.de/. 1 Author published this work under the Creative Commons Attribution 3.0 Unported license.